Political Science - U.S. Senate, Washington, D.C.
How did you hear about your internship? 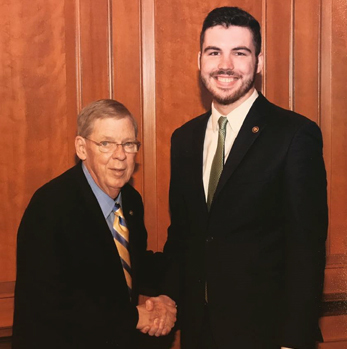 An alumni of my fraternity had interned on the Hill and was extremely helpful when it came time for me to determine where I would be completing my undergraduate internship. He gave me the encouragement I needed to apply for an internship that I originally thought was unobtainable at best. What has been the most valuable (or favorite) part of the experience? The entire internship was truly a once in a lifetime opportunity. I walked the hallways with senators and reporters. I sat in the Supreme Court on my lunch breaks. I saw the policy making process in a way that my peers could only dream of. Though the entire process was memorable, the connections made in DC are what I would deem to be most valuable. The connections I was able to make have already proven to be useful for my future. Senator Isakson’s Chief of Staff recently provided me with a letter of recommendation for my law school applications. Before my internship was over, I had the opportunity to see history in the making when former F.B.I. Director James Comey publicly testified before a senate committee. I would say that that was my most memorable experience. How will this help you in the future? Even as an intern, I was able to sit in on committee hearings and meetings. This provided me with a unique view as to how the entity at the core of my studies functions on a day-to-day basis. More practically, an internship in the Senate will be useful when I apply to law schools this fall.